Breakpoint 1: file countdown.rb, line 1. Breakpoint 2: file countdown.rb, line 2. Breakpoint 3: file countdown.rb, line 3. Breakpoint 4: file countdown.rb, line 4. Breakpoint 5: file countdown.rb, line 5. Exceeded the setable number of breakpoint. 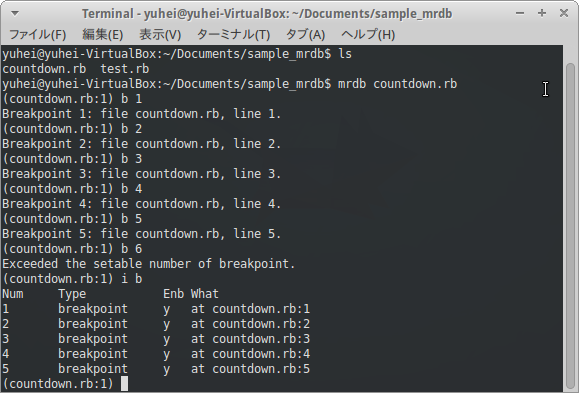 Breakpoint 6: file countdown.rb, line 6. Breakpoint 7: file countdown.rb, line 7. Breakpoint 8: file countdown.rb, line 8. Breakpoint 9: file countdown.rb, line 9. Breakpoint 10: file countdown.rb, line 10.